Behind the scenes, we're many faces all with the same goal, connecting you to what matters in your world. Our leadership team comes from a wide range of backgrounds, with 70+ years experience in the technology and telecommunications industries. We like to push the boundaries of what 'traditional' is. We focus on developing easier and more enjoyable ways for kiwi homes and businesses to get the most from technology. Hamish is the face of the NOW brand. Back in 2011, Hamish saw that something was wrong with the NZ telco industry and set about putting it back on the level - delivering kiwi homes and businesses the levels of service they'd been deprived of for years. As a leader coming out of New Zealand and Australia's largest service brands, Hamish brought the passion and energy that was needed to shake things up. Rest assured he's not all work - Hamish is at home on the ocean, from riding a clean left-hander in Gisborne, to retrieving his prized craypots from Hawke's Bay's secret spot. Craig is an opportunities man. 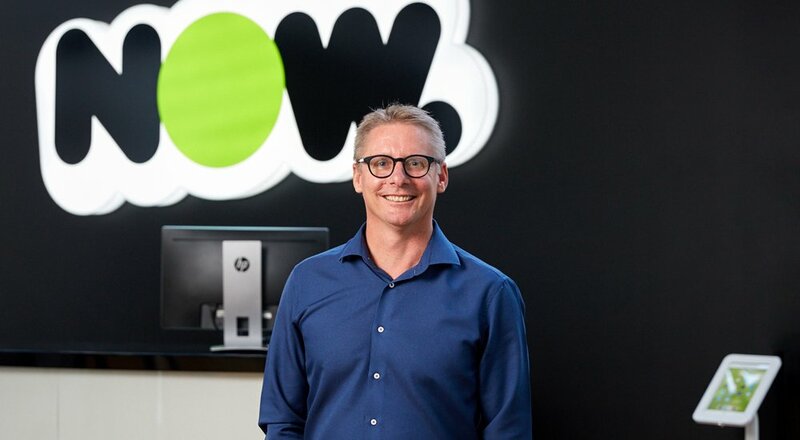 He's at the forefront of identifying ways for NOW to help more kiwi's get the most out of their communications, while keeping our governance board happy that we're doing the right thing for everyone. Having come from a number of financial controller and governance roles, it's always tough to slip an expense claim through without Craig getting his eyes over it. He's our inspiration for the latest 12hr smoked brisket recipe and there's not a day goes by when you can't hear Craig's laugh echoing throughout the office. Brendon is our story teller. As an experienced marketer, he counts himself pretty lucky to have the responsibility of looking after the NOW brand and the products and services we offer our customers. He's passionate about understanding our customers and how they want to live and work, with technology in their lives. He's never short of an idea and he's got that great pedantic nature that lends itself to getting the right shade of green to all of our advertising. Keep an eye out for him stumbling around one of Hawke's Bay's rivers with a fly fishing rod, in pursuit of that elusive trophy brown trout. Rachel won't let you down. She's a formidable force around NOW, not only in setting the highest bar for how we deliver a brilliant experience for our customers, but she manages to keep Hamish in-line too. Having helped the company get to where it is today, Rach has taken on the development of our customer experience and support team. Her goal - have more advocates than any other telco in NZ. When she's not travelling to exotic locations, Rach spends a fair bit of time working on her eye for interior design. Alex is the driving force of business sales. She is always out there looking for businesses who aren't getting the service or support from their current provider and are looking for a fresh, more reliable, alternative. Working across the country, Alex uses her years of experience in enterprise sales to ensure we're understanding and meeting the needs of prospective clients. When she clocks off you can find her near, in or on the water – fishing, boating and swimming; enjoying the finer things in life (food, wine, music) with friends and family. Grant is the person who drives us all to deliver, on-time, for our business customers across NZ. After years in the UK and Australia working in IT and service delivery he and his family moved back to Napier. His attention to detail ensures the high standards of NOW customer service and delivery are always in focus. The move to the Bay has been a great balance to his family lifestyle, the only thing left to deliver on is some numbers off his golf score and more time on the bike.